Our volunteers are a huge reason why our agency is able to operate. 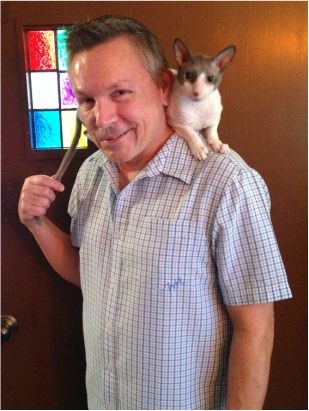 Please help us in thanking Larry (pictured with his cat, Simon) for his 9 years of volunteering with us. If you have the pleasure of knowing Larry, you probably have been invited to his home and know how beautiful it is. Larry and his partner, Mike, have created a home that would inspire poets to write and musicians to sing. They have incredible photographs, artwork and flying figurines intentionally and artistically placed throughout the rooms. And as you admire their space, Simon the kitty will follow you with his big, green eyes. But the true pleasure in visiting their home is not only in their décor, it is visiting the two people that live inside. When asked where he is from, Larry chuckles. His step father served in the United States Air Force and consequently, Larry spent his childhood bouncing around the world. However, he considers Phoenix, Arizona to be where he is from. He moved to Topeka with his partner, Mike, 16 years ago. They have a cat, Simon Rex, who is almost 3 years old. Larry speaks about volunteerism, why he chose Positive Connection to volunteer, and the hiking opportunities that Topeka has to offer. 1) What do you do as a volunteer at Positive Connections? What does a typical shift look like? I mostly volunteer in the food bank. The food bank is open once a week and the shift is about 3 hours long. I first make up plastic bags for groceries and I go over the grocery sheet with Tami (administrative assistant) to make sure I understand it. I might ask Tami a few questions about new food items so that if a client asks me a question, I’ll have an answer. If I don’t have help from other volunteers, I walk clients through the food bank and check off the items that they choose from the grocery sheet. If I do have another helper, then the volunteer bags up the groceries and sometimes, we trade responsibilities so that they can also talk with the clients. 2) What’s your favorite part about volunteering and why did you choose Positive Connections? Volunteering gets me out of the house (Larry laughs) and keeps me engaged with other HIV positive individuals in our community. Since I am HIV Positive, volunteering at Positive Connections allows me give back to the agency that has given so much to me. I have been with the agency for 16 years and a volunteer for 9 years. 3) What do you do when you are not volunteering? I love to hike and workout. I love the Shunga trail, Cedar Crest and Shawnee Lake for hiking. I love being outdoors! The Gala of course! It is such a great time! I love the photobooth! The Gala is fun because I get to reminisce with old friends and clients who I haven’t seen in a while. 5) Leave us with an inspiring quote or short story. Can be anything! I genuinely want to give back to my community, specifically people who live with HIV/AIDS. Positive Connections is always in need of volunteers for several efforts, including office/administrative help, fundraising events, and information/outreach tabling. Our volunteer program begins with a volunteer application. We have provided the volunteer information packet for you to download, or you may contact us to have it mailed to you.